The Medicines Communication Charter is about having a better conversation about medicines. The campaign and the charter is not about clinical care, and it is not about any particular medicine. That is strictly between patients and their clinicians. 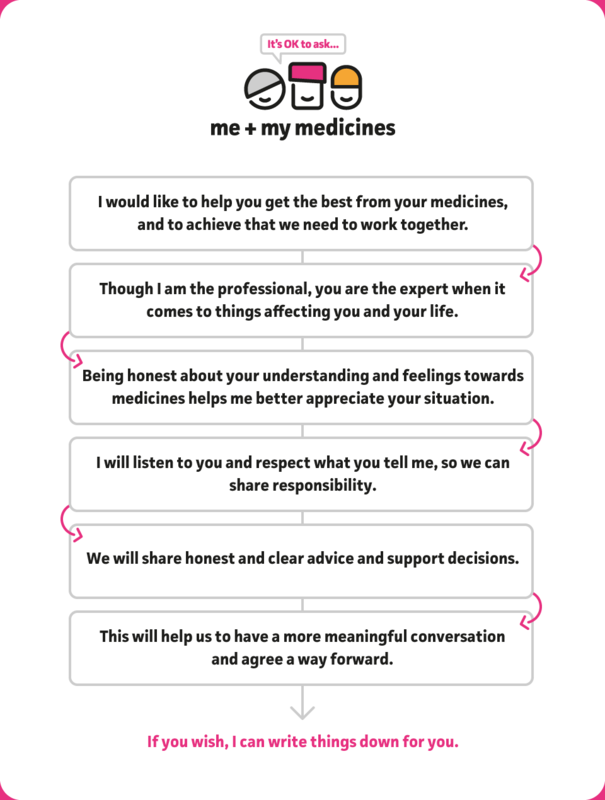 ‘Me and My Medicines’ is a campaign led by patients and supported by clinical staff to help people raise any concerns and use their medicines better. This will help everyone benefit from more effective and safer care. ‘It’s OK to Ask’ means patients, families and carers are encouraged to ask questions about their medicines so that they can be helped to get the most benefit. Medicines are widely used by the NHS to prevent and treat poor health. When medicines are not taken or used properly, it can lead to poor and worsening health and wellbeing. The Medicines Communication Charter is a way of encouraging the conversation around medicines between the patient and healthcare professional in such a way that everybody wins. The charter is a promise of honesty and mutual respect. It is designed to ensure every patient gets the best possible outcome from their medicines. Everyone helping the patient’s experience of the NHS, including Community Pharmacy, GPs, Hospital Doctors, Nurses and Hospital Pharmacy is being encouraged to listen, better understand, and help overcome problems when using medicines. It is expected that by adopting this approach more people will have the confidence to use their medicines as agreed and that inequalities in health and wellbeing outcomes will reduce.